The Cuisinart DCC-3000 is an excellent mid-range machine that boasts unmatched convenience, with just enough power to brew a great cup of coffee. While the most seasoned of coffee enthusiasts will walk away unimpressed, this machine was not designed for them—they can stick to Bonavita and Technivorm. This machine was designed for the average coffee drinker, someone who doesn’t want to fuss around with filters and carafes every time the caffeine itch strikes. Cuisinart DCC-3000, dubbed the Cuisinart Coffee-on-Demand, is a mid-range programmable brewer with a slew of incredibly convenient features. On top of being one of the most convenient ways to brew your daily coffee, the DCC-3000 is also one of the best-performing brewers under $100. 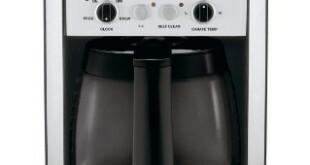 The most notable feature of the Cuisinart DCC-3000 is its coffee reservoir system. Opting out of using a standard carafe, Cuisinart has engineered their brewer in the likeness of a dispenser. The brewing process takes place entirely within the machine’s enclosure, and the coffee is stored in a dual-walled 12-cup reservoir next to the water tank. Once the brewing process is complete, the coffee can be dispensed one cup at a time as needed. While this is incredibly convenient, be careful not to let the coffee sit in the reservoir too long; it becomes stale and bitter after a few short hours. A “fuel” gauge on the front face of the DCC-3000 indicates how much coffee remains in the reservoir. Unfortunately, some customers have had issues with the gauge, citing major accuracy issues. 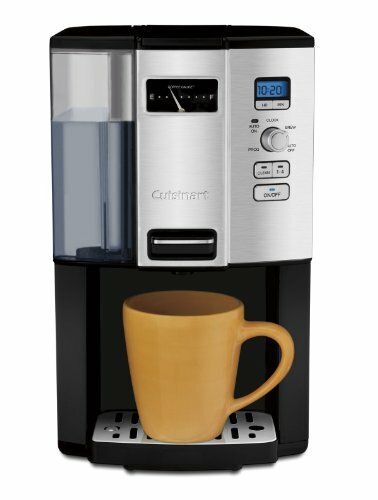 The Cuisinart DCC-3000 also features a removable water reservoir for easy filling, a charcoal water filter for a cleaner-tasting cup of coffee, and a permanent gold tone flat filter for convenience. A pack of standard paper filters is also included in the package for those prefer coffee without sediment. The DCC-3000’s programmability feature works as expected: Set the time you want fresh coffee to be ready, and the Cuisinart Coffee-on-Demand will do the rest. If you only need a few cups brewed, you can use the 1-4 cup setting, which optimizes steeping times and water temperature for the smaller load. Speaking of brewing temperature, customers report that the Cuisinart Coffee-on-Demand reaches a respectable 190° F. While it misses the ideal (180° F) slightly, it is a considerable improvement over brewers in the same price range. For grind saturation, the DCC-3000 uses a large circular showerhead, reminiscent of the design found on Bonavita machines. Over time, calcium deposits will build up on the metallic surfaces of the machine, impacting device operation and the flavor of brewed coffee. This affects every coffee maker in every price range. Drastically simplifying the maintenance process, Cuisinart has included a “Clean” function on the DCC-3000. A light on the front panel will begin to flash when calcium deposits are reaching critical levels, signifying that it’s time to maintain your machine. Instead of having to manually scrub the machine’s every orifice, the DCC-3000 offers a convenient solution: Remove the charcoal water filter, fill the water reservoir with a vinegar-water solution, and press “Clean.” Maintenance done. Designed for ultimate convenience, the only feature missing from the Cuisinart DCC-3000 is a grinder. The impressive brew temperature and showerhead nozzle are meaningless if you’re brewing pre-ground coffee. Even if you’re grinding your own beans at home, leaving grinds in the filter basket overnight will undoubtedly degrade the coffee’s subtle aromatics. Unlike many Cuisinart devices before it, the DCC-3000 is a fairly attractive device. While it sticks to the same blocky motif found on other Cuisinart appliances, the results are somehow more palatable. This can be attributed to a cleaner and less wasteful design, attractive stainless steel accents, stylish asymmetry, and more delicate and less industrial motifs. The Cuisinart DCC-3000 is a heavy, sturdy, and well-built machine. Although this design strays from the industrial motifs of older Cuisinart machines, it is just as heavy-duty and reliable. On the exterior, the DCC-3000 is a tank. On the interior, however, several build quality issues arise. Leaking is a recurring problem for some customers, caused by a malfunctioning dispenser actuator. Several customers have noted that this might be caused by loose grinds falling into the actuator valve, preventing it from locking into place. Another issue, mentioned previously, is an inaccurate coffee gauge. Some customers complain that the gauge remains on empty or behaves erratically during coffee dispensing. It is hard to determine whether these issues could occur on any unit or whether they are the result of a manufacturing defect. In either case, if you end up purchasing this brewer, keep an eye out for leaks. How Much Does The Cuisinart DCC-3000 Coffee-on-Demand Cost? We partnered up with Amazon to provide you the lowest price for the Cuisinart DCC-3000 Coffee-on-Demand. thank you for your valuable feedback and notice. that’s too bad, seems like a production error. Unfortunately, as a gift you may not have received the receipt, but maybe you can see if you can the receipt to claim a repair, refund or replacement? We had the same problem with the clean light when we first got ours two years ago. We called their toll-free number from the instruction booklet and was told to unplug it for about a minute, then plug it back in. Have not had the problem since then. Simple, but effective. Approximately how many minutes does it take to get to the five beeps? I just bought this yesterday so I’m totally new to it and I’m hard of hearing. Even with hearing aids I don’t always hear things. Is it about as long as your average Mr Coffee maker? this depends on the number of cups you’re making. However, it stops when it’s done but maybe you can time it once for convenience? Thanks for the reply. I made 1-4 cups this am and after the percolating sound stopped I still waited a couple more mins and never heard any beeps. It was about 7 mins total. So either the function doesn’t work, it takes more time, or it’s so faint that I didn’t hear it. Update. This am I heard the five beeps. They are very faint. Yesterday I wasn’t wearing my hearing aids and even tho I was right in front of it I didn’t hear them. This am I was wearing the aids and could hear it. barely. Hi, thank you for getting back on this one and good to know it does work, be it barely hearable. Thank you for your feedback! Barely hearable for me. Someone with healthy hearing should be able to hear it. This is my second purchase of the DCC-3000, the first one was purchased in 2011 and leaked horribly. I would not have purchased another one but, while out of town, it poured out even more and so my husband bought another one, same model. This one leaks too, my cleaning light never came one for the first one or for this one. This one is less than a year old. I’ve used the check list for the possible reasons and still have water everywhere. Recommendations? How long is the cord supposed to be? Mine seems to be about 1 foot long. I can barely get it to reach the plug which is 1/2 way up the counter wall, and I have to unplug the machine to fill the resovoir. The cord may just be hung up and need a good yank, but i don’t want to ruin the machine if this is really how it was designed. The water reservoir is removable, so you can leave the machine where it is and just take the reservoir off to re-fill it. We’ve used this machine daily now for 2 years and are very happy with it. We did have a leak, but discovered it was indeed due to coffee grinds in the valve, which was easy (fiddly, but simple) to resolve. When filling it completely, we’ve discovered that turning it off for a minute halfway through the cycle helps – the water in the filter has time to go down before it’s full again, and there is far less grind overflow. Over time, the gauge is definitely less reliable and needs a good tap to show accurately. It is showing its age now and has not worked on occasion, but after fiddling with the reservoir valve and ensuring everything was clean, it was fine. I will be very interested to see how much longer we will have this machine as I do like the design very much. Thank you Laura for providing your answer! I have had this model for about 5 years. Cuisinart replaced the first one because the reservoir developed a crack while under warranty. I have had this one for about 2 years. Every once in a while, I’ll find water up to the rim in the drip tray and water all over the counter. Coffee grinds are dry. I just cannot figure out where the problem lies as the water is obviously bypassing the shower head. If this keeps up, it’s going in the trash. I had this problem too, I found that I had to check the spring on the actuator lever for grounds and other debris. Turn the bucket upside down under the faucet and push down on the “spring” several times to dislodge anything that might be there. i even took a small brush and cleaned it too. I do this all the time, especially if I didn’t drink all the coffee and it sat there all day. so far it works and I’ve had the maker for over 3 years. The only thing that doesn’t work is the gage and I don’t know how to fix that, wish I did. The carbon filters are a waste of money!!! If you look at the water filter holder, it allows water to bypass the “activated carbon water filter”. !! !Totally useless!!! Don’t waste your money on replacing the filters. Use purified or R/O water in your machine.